I had a lot of reasons for deciding to homeschool my kids, like I don’t like being told what to do and other people annoy me. But a big part was that I wanted to give my children a classical education that prepared them to be civilized, cultured adults who knew things about a lot of the world and could learn more and discuss things like reasonable people. I didn’t see a lot of this happening at the schools I had access to, and while there are great options like Aquinas Academy in our area, I was certainly not in a financial position to do those. And I knew from the beginning that Latin was going to play a huge role in my curriculum. My husband and I have something like eight years of Latin between us, and we both think the fact that the other studied it is adorable. I just think there are so many benefits- spiritually as Catholics, culturally as, well, cultured people, and neurologically since it’s totally a foreign language even if it’s dead. 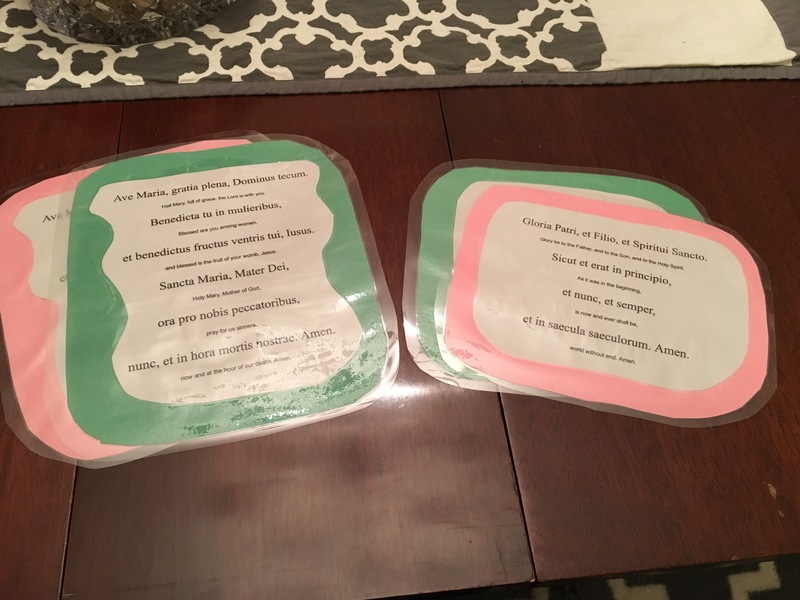 Our daughter is in first grade this year, and the curriculum company we use for most things offers a great early elementary level Latin program. I added it to my cart, broke it up into weekly lesson plans, and got psyched to impart my wisdom on my kid. Ahhh. And then…it imploded. This program? Is awesome. Really. It is. Check out the Prima Latina program from Seton. But it is NOT how my seven-year-old currently learns. It was frustrating to me, since I really wanted this to be a part of our homeschooling. But I didn’t want to squash her love of learning by forcing her to do things she didn’t like when it was clearly not working. But then I’m her teacher so I have to force her to do some things she doesn’t want, so maybe this should be it? Anyway, by Christmas break, Latin was increasingly getting ignored because I didn’t feel like fighting her to sit down and use a workbook. I figured we’d have to wait a few years to tackle Latin. I get it, I mean, I was in seventh grade when I started, and my husband was in high school. It wasn’t the end of the world. But I really loved the idea of it being such a part of her life from the beginning. And I knew that other schools (like Aquinas) did it with great success. So I prayed to the Blessed Mother about it for like two months, and continued ignoring it. A tiny little idea came to me. Just teach her the Ave Maria. I can do that. I’ve taught her literally every other prayer I know. I’ll just teach her the Ave Maria and even if she doesn’t sit down and use the workbook, at least she’ll learn some of the words. And then I realized- SHE’LL LEARN THE WORDS. Literally, this is how to teach children anything. So I taught her the sign of the cross, and the Ave Maria. And once we did that- amazing things happened. I realized I could weave Latin through the rest of our school. We recite the prayers together all the time. I sing her the Ave Maria (Gregorian chant version- I do not have a great voice, and it’s the only one that doesn’t make ears bleed when I attempt it.) We practice cursive and handwriting by copying the Latin words. We even used it as an art class- I write the Latin words and English words on a sheet and the kids cut them out and glue them on to construction paper. I laminate them and put them on a ring and they have a special prayer book to bring with them in the car or to Mass. So that’s the wisdom I’ve picked up from this second year of homeschooling. You can teach your kids things. Hard things. Just make it small and fun and not terrifying. Don’t flip out about it. And pray. Because Mary will listen to you. Even if you should have been able to figure this out before. This entry was posted in Uncategorized and tagged catholic, first grade, homeschooling, kids, latin, religion, teaching by Kathleen. Bookmark the permalink.